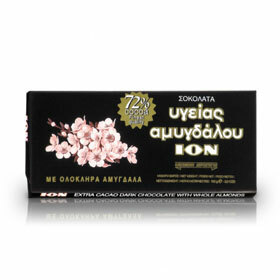 GreekShops.com : Greek Products : Snacks & Desserts : ION 72% Dark Chocolate w/ Almonds 100gr. [Code : 5012501034076] ION 72% Dark Chocolate w/ Almonds 100gr. ION 72% Dark Chocolate w/ Almonds 100gr. From the leading Greek Chocolate producer comes this unique and rich in flavor, 72% cocoa chocolate with whole almonds. This product is suitable for Lent since it contains no dairy. Note: This is a heat sensitive product. Our couriers cannot avoid the exposure of your package to temperatures that may affect the quality of this item upon receipt. We do not recommend this product for delivery to areas experiencing high temperatures, or guarantee product condition to any destination during the summer months.